There is nothing quite like a high-scoring game of football. The roller coaster of emotion as defenses capitulate at the sight of free-flowing attacking football, high drama, high stakes and historic moments. Plenty of the Premier League's most memorable games have included a high number of goals, a multitude of which even reached double figures. There is a reason why the Premier League is the most entertaining league in the world. Together, let's look at eleven games in Premier League history where one team (or both) simply forgot to defend. 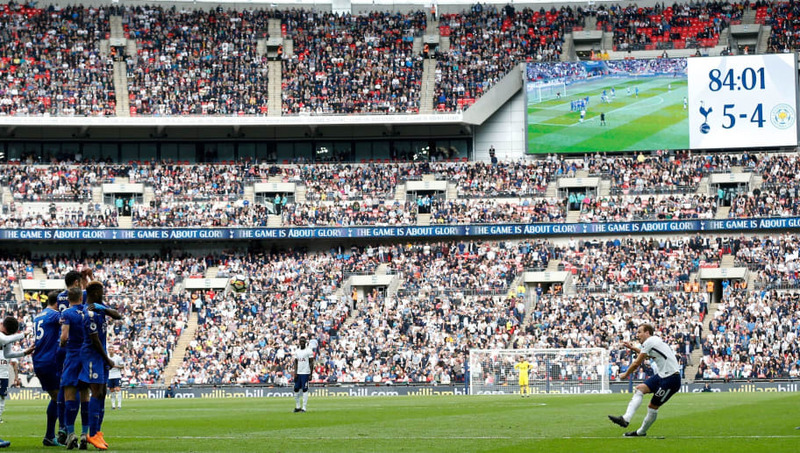 The most recent game to feature amongst the list of highest-scoring matches is this end of season clash between Tottenham and Leicester at Wembley. Whilst any title race excitement was extinguished some time before the final day of the season, this instant classic made sure the Premier League season was sent off in style. With Harry Kane still chasing down Mohamed Salah for the Premier League golden boot award the game was always going to provide goals, but nobody could have foreseen this nine-goal thriller. Tottenham found themselves 3-1 down within two minutes of the restart, after Kelechi Iheanacho scored with a stunning strike from outside the area. However, Mauricio Pochettino's men rallied late and found themselves 5-4 up with just under 15 minutes to go as Kane curled an effort inside the far post from just outside the area. 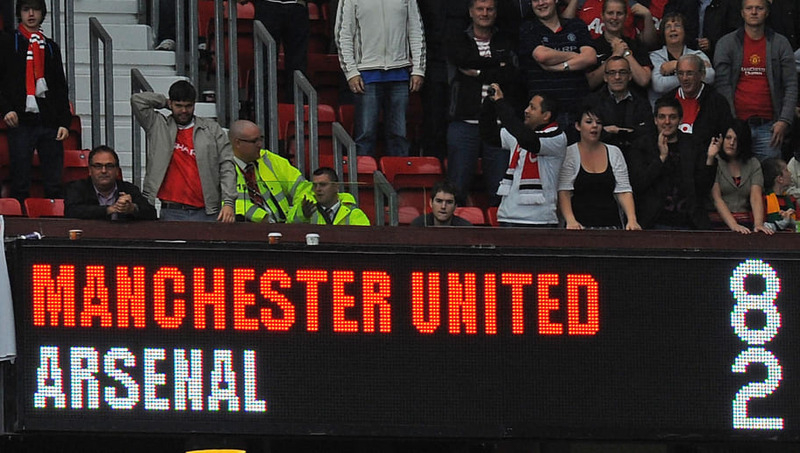 This game is one to cherish for Manchester United fans. Not only is it one of the biggest routes in Premier League history, but also features what is potentially the greatest substitute appearance of all time. It didn't take long for United to get going against what was a disappointing Nottingham Forest team, as they were 2-1 up within seven minutes of kickoff. Things only got worse from there for the home side as Sir Alex Ferguson's team extended their lead to 4-1 twenty minutes after half time. With 20 minutes to go in the game, Ferguson decided to give Ole Gunnar Solsjkær a run out in a game which was already comfortably won. Solsjkær went on to score four goals in the final ten minutes, showing no remorse for the side who would eventually finish at the bottom of the Premier League table. The picture says it all. Sheer pandemonium. 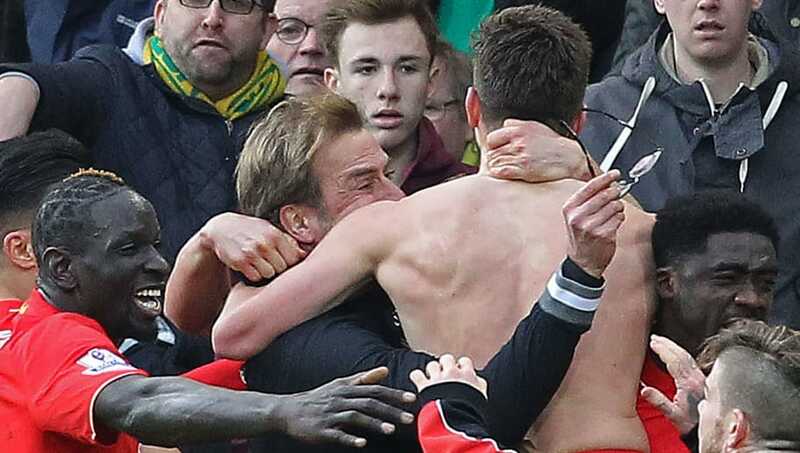 The utter joy from Liverpool players and their manager alike, perfectly set against a background of heartbroken Norwich supporters. This was one of the most electric finishes to a game ever. Norwich had endured a terrible run against Liverpool in the build up to this game, having lost nine of the last 11 meetings between the two teams and failing to beat the Merseyside club since 1994. Norwich surprisingly found themselves 3-1 up against Jurgen Klopp's Liverpool side after Wes Hoolahan's strike on the 54th minute, only for Liverpool skipper Jordan Henderson to reply less than a minute later. After a second-half rally from Liverpool, the Canaries somehow found themselves 4-3 down as the game entered stoppage time. A raucous reception met Sebastien Bassong's 92nd minute strike and what looked like an impressive point, only for Norwich hearts to break as Adam Lallana's left footed volley made it 5-4 in the 95th minute. Manchester United were well and truly in the mood for this one. 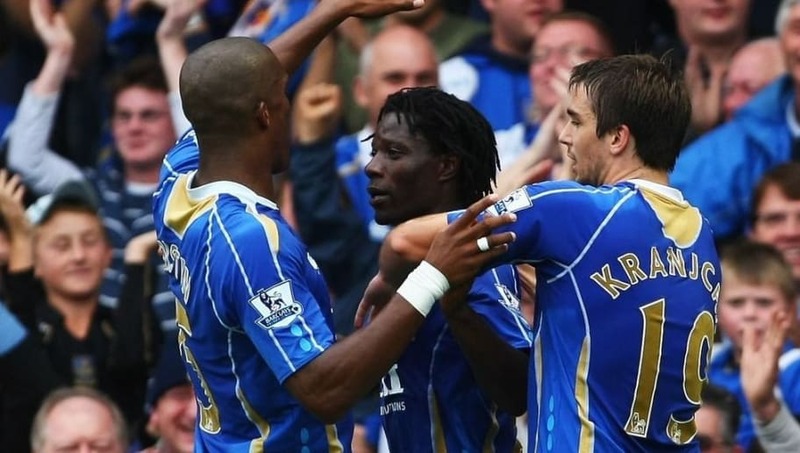 The then reigning champions of England dismantled Ipswich Town on their visit to Old Trafford for what remains the highest winning margin of any game in the history of the Premier League. 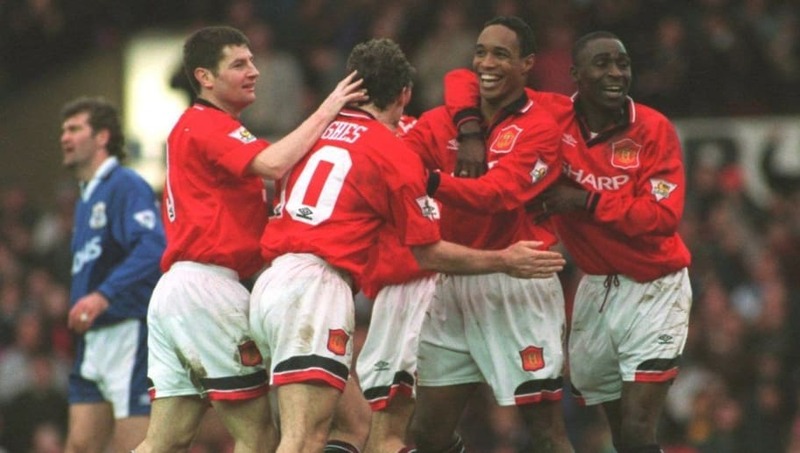 That wasn't the only piece of history made in this game, as Andy Cole became one of only five players to score five goals in a single Premier League game. Roy Keane and Paul Ince both managed to score in this fixture whilst Mark Hughes netted twice within five minutes to compound Ipswich's misery before the hour mark. A sorry day for the Suffolk club who crashed out of the league that year after three consecutive seasons in the top flight. The north London derby is one of those fixtures that always promises to be a classic, with a handful of memorable fixtures throughout the year. This game is up there with the best of them. Tottenham took the lead through Noureddine Naybet with 37 minutes gone after Arsenal's defence failed to deal with a free-kick, only for Thierry Henry to equalise in stoppage time before the end of the first half. The game exploded into life after the restart, with Arsenal 4-2 up before 70 minutes thanks to goals from Lauren, Patrick Viera and Freddie Ljungberg. Ledley King made things interesting with 15 minutes to go, but a Robert Pires goal saw off any late charge from Spurs, despite Frederic Kanoute scoring the game's ninth goal in the 88th minute. This game sticks in the mind as Theo Walcott's best appearance for Arsenal. On the fringes of the team with six months left on his contract, Walcott needed to show manager Arsene Wenger why he should remain a part of his Arsenal plans. Scoring an emphatic hat trick and getting two assists, Walcott's performance was mesmerising. The most memorable moment being his wonderful third goal, in which he took on four Newcastle defenders from outside the left hand side of the box - before seemingly being brought down by Jonjo Shelvey, only to pop straight back up and lift the ball over a helpless goalkeeper. The game was 1-1 at halftime, with Demba Ba answering Walcott's first before the break, but further goals from Alex Oxlade-Chamberlain, Lukas Podolski and a brace from Olivier Giroud swiftly saw off any Newcastle challenge. As comprehensive a win as you will ever see as Tottenham recorded their highest goal tally in a single game since they beat Bristol Rovers 9-0 in 1977. Peter Crouch opened the scoring inside of ten minutes with what was remarkably the only goal of the first-half. The second period however began with a flurry of goals, Jermaine Defoe had managed to score a seven minute hat-trick between minutes 51-58, with Wigan's only goal of the game also coming before the hour mark (Patrick Scharner made it 3-1 in the 57th minute). Defoe would go on to notch another two goals later on in the game, and join Andy Cole in the group of players who had managed to score five in a single Premier League game. Aaron Lennon, Niko Kranjcar and David Bentley would round out the scoring of one of the biggest wins in league history. The festive period is commonly known as 'the most wonderful time of the year' and the saying couldn't be more true for football fans, as we're treated to a whole host of games between Christmas Eve and New Year and usually some high profile clashes. In the winter of 2007 it's doubtful that anybody's marquee fixture was a showdown between Tottenham and Reading, but what a game it was. Reading can rightly feel hard-done-by with the final result, having taken the lead on three separate occasions throughout the 90 minutes. Ultimately however, the sheer class of Spurs' striker Dimitar Berbatov proved to be too much for the opposition. Spurs dominated the last 20 minutes with goals from Steed Malbanque, Jermaine Defoe and two of Berbatov's four for the day. His incredible talent carrying Tottenham's leaky defense to three points on a day where this Spurs outfit really could have been troubled by a resilient Reading side. Another one for the Tottenham fans this one. Probably the most embarrassing loss in Premier League history. Arsenal went to Old Trafford for another chapter between the most intense managerial rivalry the Premier League has seen with the hope of showing their intent for the season ahead after no wins in their first two games. What followed was a complete dismantling of an Arsene Wenger team the likes of which had never been seen before. Arsenal were 3-0 down before half time after goals from Danny Welbeck, Ashley Young and Wayne Rooney, but went into the break with a glimpse of hope thanks to Theo Walcott's goal in the third minute of added time. Whatever the Arsenal manager said in the changing room clearly didn't provide the desired effect as Arsenal continued to look sloppy defensively and offered very little going forward. Goals from Nani, Park Ji Sung and Rooney's second of the game before a consolation goal from Robin Van Persie made it 6-2 with 15 minutes to go. Rooney got his hat trick after an 82nd minute penalty, and Ashley Young's second of the game rounded out a dismal day for the Gunners as they lost 8-2 against Manchester United. Sir Alex Ferguson's last day in management. His final season had already proven to be somewhat of a fairy tale. With Manchester United comfortably crowned champions of the Premier League whilst handsomely outscoring the rest of the league in both points and goals, this game at the Hawthorns was supposed to be one final victory for one of the game's greatest ever managers. West Brom didn't get the memo. United looked to have had the game won by halftime. The Red Devils went into the break 3-1 up thanks to goals from Shinji Kagawa, an own goal from Jonas Olsson and the third courtesy of Alexander Buttner before a response from James Morrison five minutes before the break. Romelu Lukaku came on at half time and made it 3-2 just after the break, but responses from Robin Van Persie and Javier Hernandez seemingly took the game out of reach for Albion. Going into the last ten minutes West Brom threw everything forward to try and make the scoreline more respectable, but even then nobody anticipated the momentous comeback that unfolded. Both Lukaku and Yousseff Molumbu scored in the 81st minute, before Lukaku crashed in his third of the game to complete West Brom's historic comeback and his second-half hat-trick. 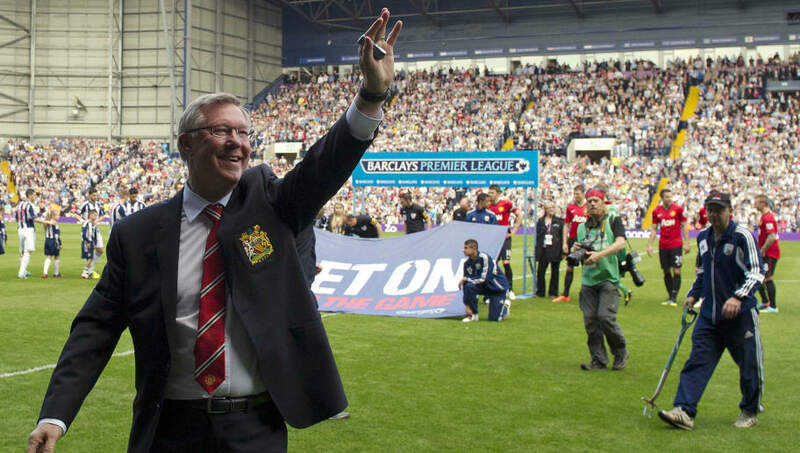 It was Sir Alex's 1,500th and final game in charge, and arguably his most exciting. The ultimate question for any pub quiz, 'the highest scoring Premier League game in history was a match between which two teams? ', nobody's first thought would be Portsmouth and Reading. A game that had more bad defending than quality attacking, and a moment of madness from David James, there was a little bit of everything in this one. Benjani had Pompey up 2-0 inside 40 minutes, only for Steven Hunt to score during injury-time in the first half. David James then provided a ridiculous attempt at rushing out of his goal in an attempt to clear up a forward pass, which allowed Dave Kitson to round the hapless James and tie things up with just under 45 minutes to go. A goal from Hermann Hreidarsson made it 3-2 before goals from Niko Krancjar and a third for Benjani made it 5-2 with 15 minutes to go. James was given a chance to atone for his earlier error with the score at 3-2 and saved a Nicky Shorey penalty to maintain Portsmouth's lead. A Shane Long goal with ten minutes to go almost mounted a comeback for Reading until Ivar Ingimarsson put the ball into his own net two minutes later, making it 6-3 at Fratton Park. Sulley Muntari would add a seventh from the spot in added time, before a calamitous own goal from Sol Campbell meant this game would go down as the highest scoring in league history. And there they are, 11 of the highest scoring games in Premier League history. Which one is the game that sticks out in your memory? Were you lucky enough to be there for any of these great games? Are there any not on the list that you felt were more entertaining to watch? Let us know in the comment section, or get in touch at @90min_football on twitter.